Few months ago, I bought an ALTRA Lone Peak 1.5 trail shoes and after using it on my trail running workouts and putting almost 300 kilometers as mileage, I came up with a Shoe Review which I posted here in this blog. 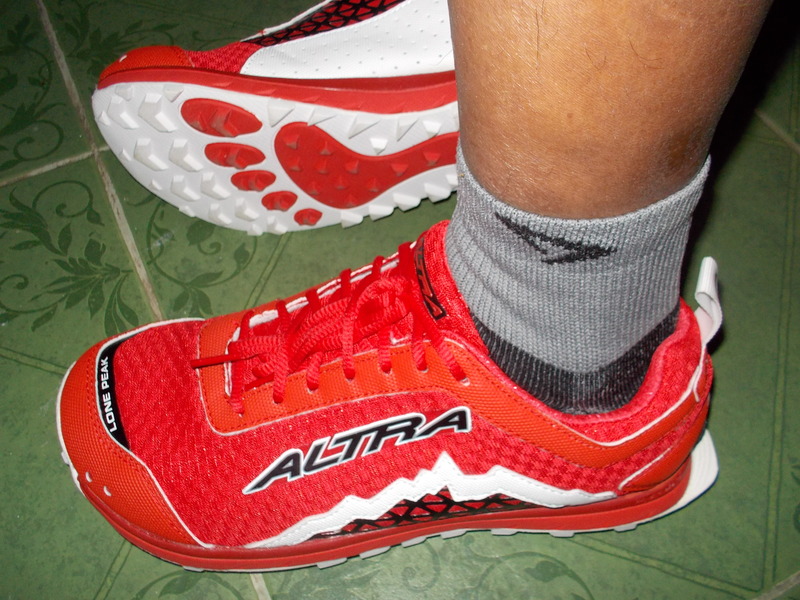 I was satisfied with the shoes with their Zero Drop concept and wider toe box but not so much on its weight when it is wet with my sweat and during my river/creek crossing; its sole traction when running on muddy trails where the sole would gather a lot of mud that would make the shoe heavier to the running legs; and the long period of time for the wet shoes to dry up during its use or when it is being “air dried”. 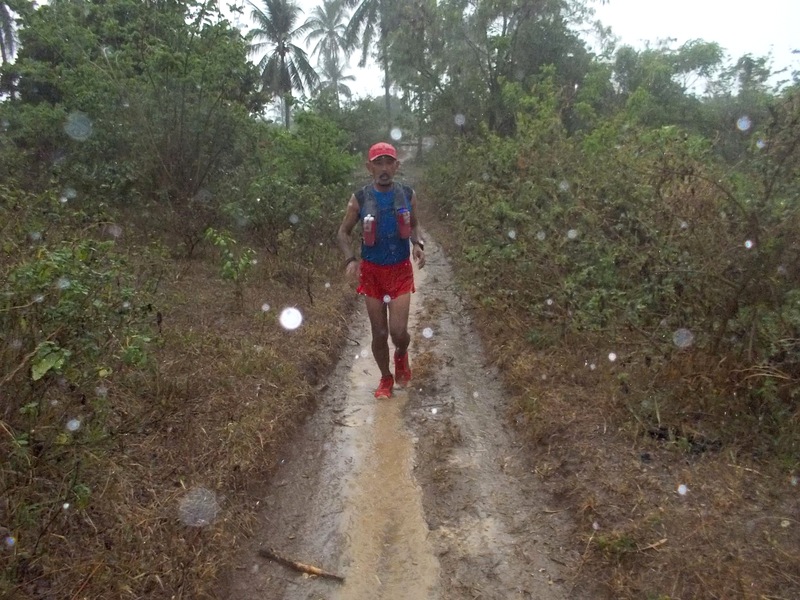 I concluded in my shoe review that the trail shoes is not suited for the muddy trails in our mountains (Philippines) but best suited for dry trails, loose gravel, rocky and technical as long as the trail is dry! I am not surprised on this because the shoes was conceptualized on what is written on the shoebox of every ALTRA Shoes. 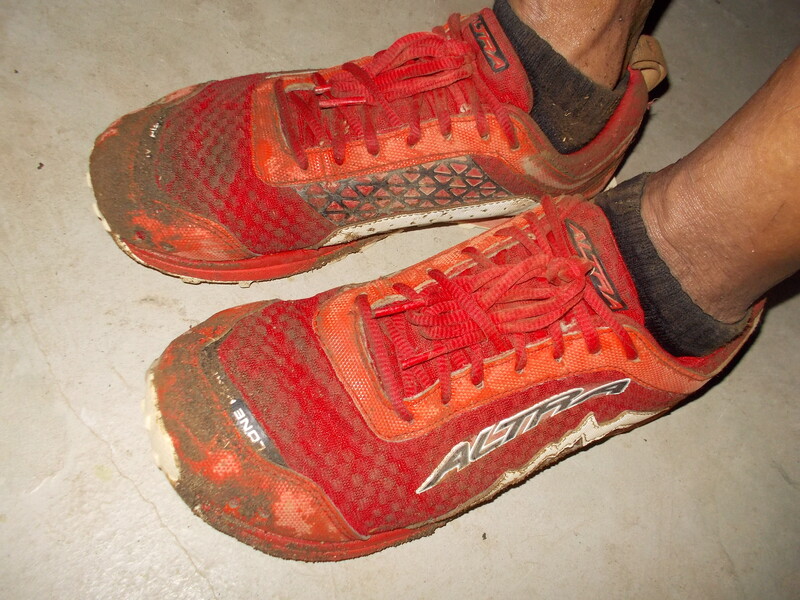 For about a week, I had been running on my new ALTRA Lone Peak 2.0 trail shoes. As soon as the shoes arrived, I immediately used it for my daily stretching and calisthenics. I immediately felt a big improvement on the cushioning of the shoes. This is a big improvement from the Lone Peak 1.5. The shoe lace is replaced with a flat and lighter material, a big improvement from the LP 1.5 heavier and rounded laces. The shoe tongue had been shortened for about half inch. The big ALTRA sign and mountain logo on the outer side had been removed, together with the “black net pattern” and white leather that you can see on the inner side of the shoes. 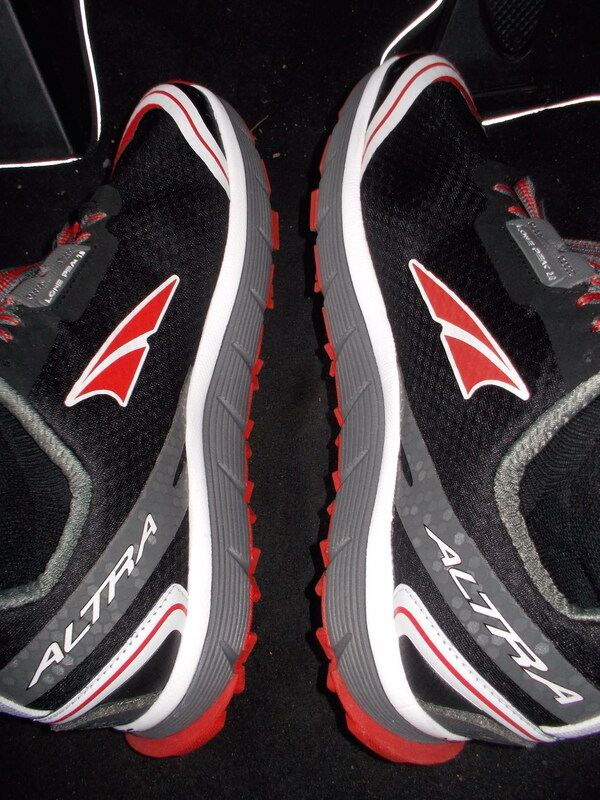 What I don’t understand the reason why ALTRA placed a leather on the #3 and #4 holes for the shoe laces. It could be for aesthetic reason where small prints of the shoe model is written but it is not necessary to sew such where the laces should pass through. The rudder at the back/heel portion of the shoes is still there but it is shortened. The velcro (with cover) for the gaiter is still there. There is a new pattern of lugs on the sole but I still have some reservations on how it would work on muddy trails. The lugs have the same thickness with that of the LP 1.5. The big improvement on the cushioning is due to a thicker sole, 3 mm thicker than the LP 1.5 and a thicker insole which is 5 mm. There is no change in the “Uppers” of the new LP 2.0 from its predecessor. It means that the new model has the same problem with its water retention, slower drying time and heavier weight when it is wet. On the website of ALTRA, the Lone Peak 2.0 has a weight of 11.4 ounces while the Lone Peak 1.5 is 9.9 ounces for shoe size 9. It means that the latest model had sacrificed or made some trade off for its weight by adding more cushioning and comfort for the feet. So, this is the reason why I could hardly noticed the weight of the shoes because of the comfortable feeling every time my foot strikes the ground. For almost 100 kilometers as mileage for this new trail shoes, I am satisfied with how it performed on my feet and on the trails. If you ask me why I did not order for the “Yellow Bus”? I have already my yellow La Sportiva Bushido and this is my first time to have a black colored trail shoes. So, the black “Ninja” shoes was ordered as part of my trail running arsenal. With this kind of trail shoes, the challenge now for me is how to run faster with them on the uphills, downhills, rocky and technical trails, muddy trails, and when they are completely wet from my sweat and after creek and river crossings. With a new 5.6-kilometer loop of ascending and descending trails as my “testing” ground, I hope to compare this shoes with the other trail shoes in my tempo/progression runs. I highly recommend the new ALTRA Lone Peak 2.0 as your training trail shoes and if you can manage to adapt on it as your racing trail shoes, then go ahead. 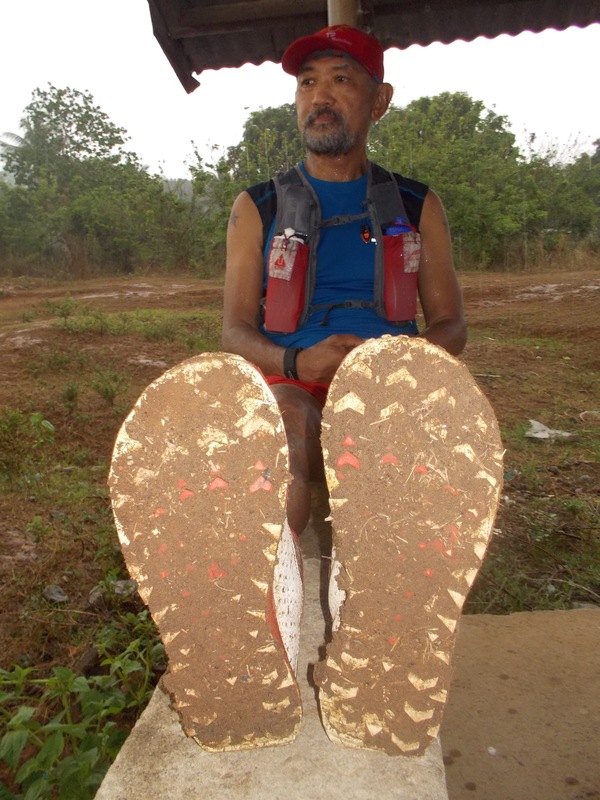 Your feet will be happy to finish an ultra distance with them! 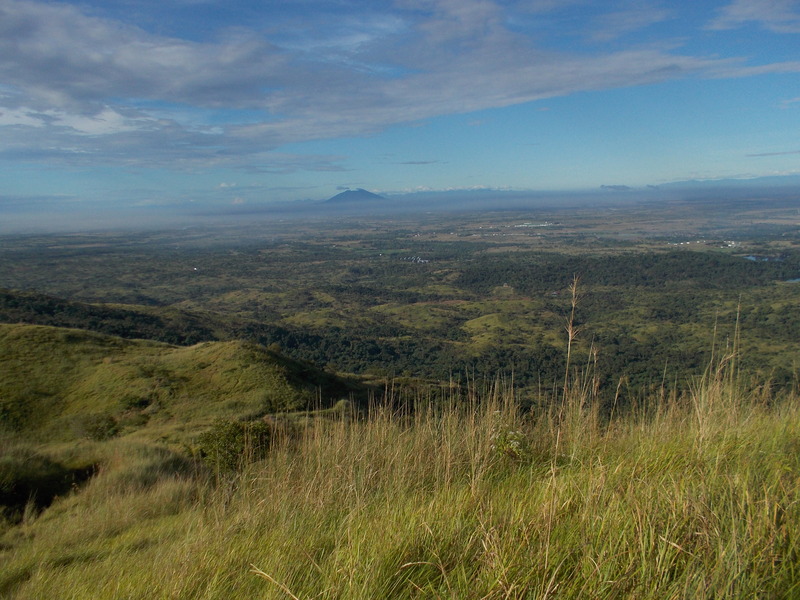 Three years ago on July 31, 2011, I made my Personal Record Time to reach the peak of the famous Hill Taklang Damulag from Fernandez Hill inside the “Molave Complex” of Fort Magsaysay, Palayan City. I was able to record a finish time of 52:37 minutes where the highest peak has an elevation of 409 meters with a route distance of 2.7 kilometers. 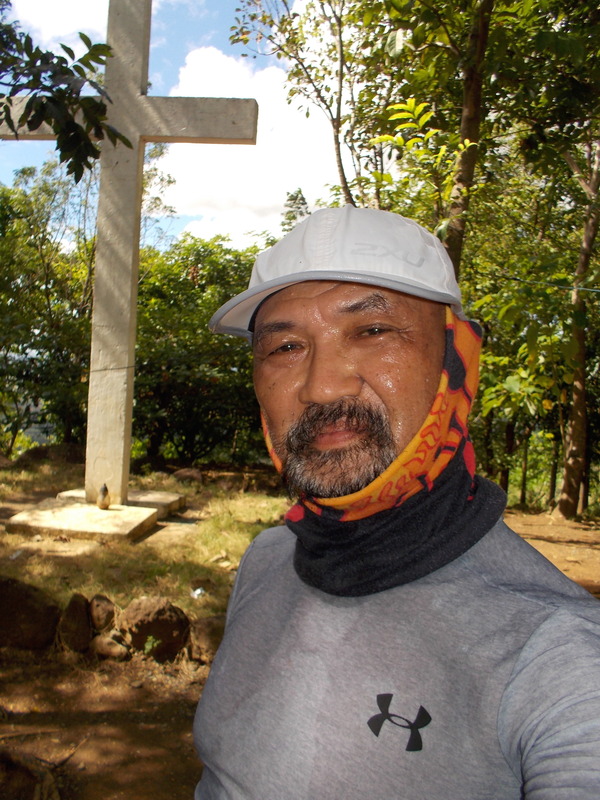 I started to record my Garmin Forerunner 305 once I departed the marker at Fernandez Hill until I was able to touch the white-painted Cross on top of the peak of Taklang Damulag. 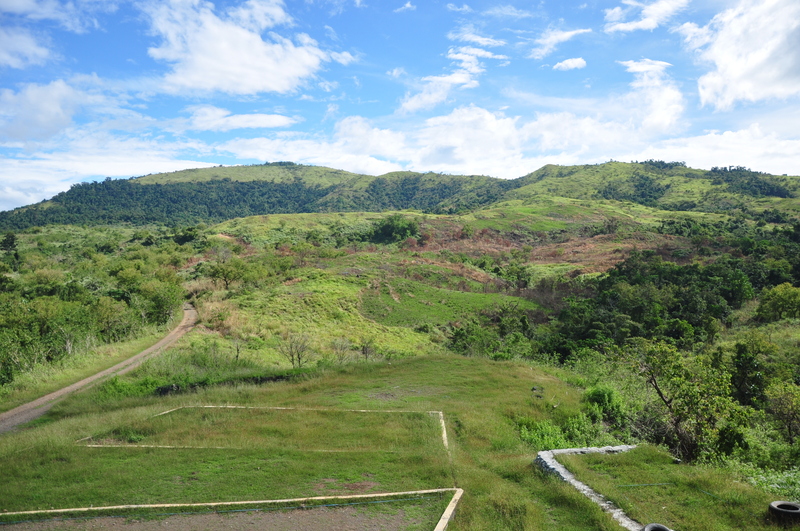 My hike was only one-way as I was able to descend on the northeastern part of the hill towards Sitio Baccao. In this post where I stated about my experience in this blog, I mentioned that that such distance as a race course is very short and the elevation of the mountain/hill is very low but if one thinks of running up and down to this mountain for four times in a single event, then you have a workout like you have hiked or run to the top and back in a high mountain. 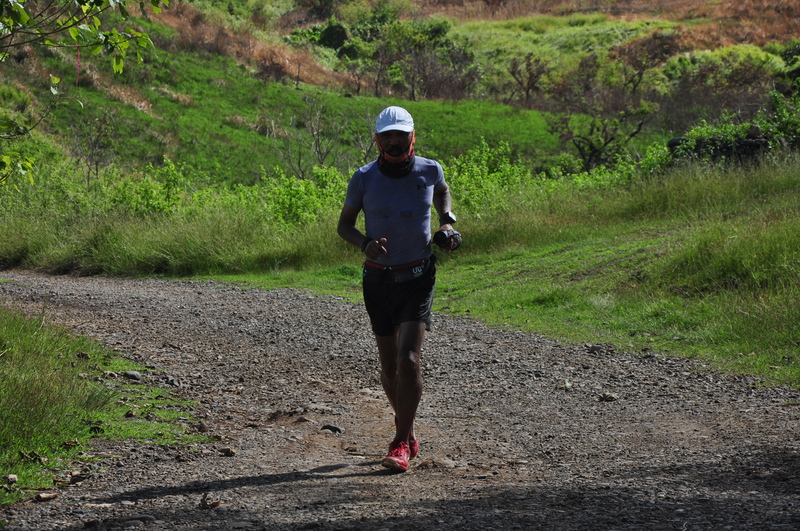 On the first day of this year’s Taklang Damulag 100-Mile & 50-Mile Endurance Runs which happened last December 13-14, 2014, I thought of having my training run by doing some “hill repeats” from Fernandez Hill Marker to the Peak of Taklang Damulag and back. On this day, I was scheduled to finish a distance of 10 miles or 16 kilometers. 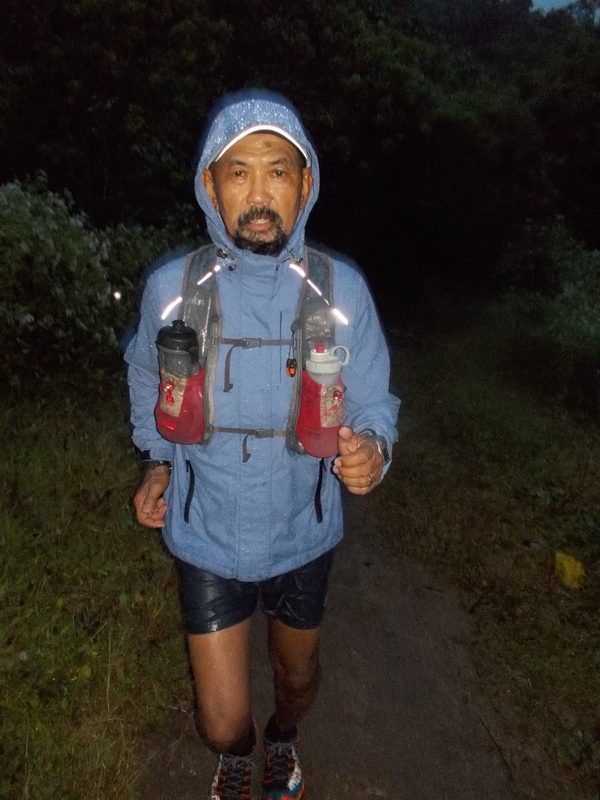 I carried one hand-held bottle with the intention of making my refilling of water at the Fernandez Hill Complex where the Aid Station of the Race is located every time I finish one repetition of the hill repeat which is equivalent to one FKT (Fastest Known Time) route. 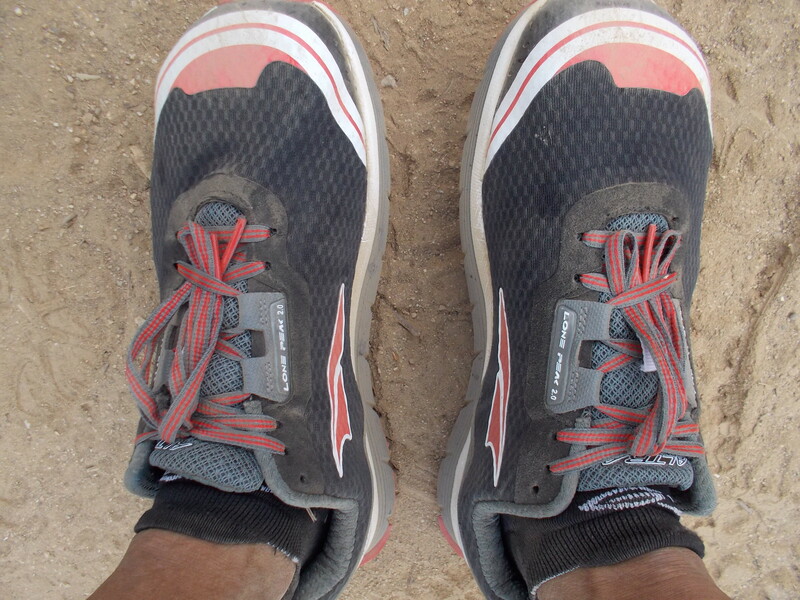 I also used my ALTRA Lone Peak 1.5 shoes for the traction I need for the downhill run back to the starting area. 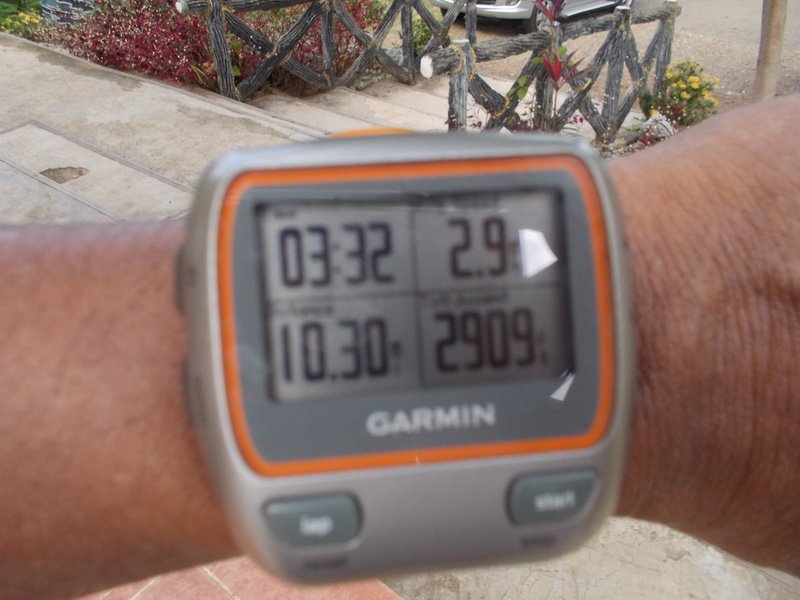 I started slowly and tried to peak up my pace whenever there is a flat portion of the route. I continuously jog my way up along the trail as I passed the usual three (3) streams on the first kilometer of the route. The trail was slippery due to damp brought about by a light shower of rain the night before. It was no problem to my trail shoes. I was surprised that I was tirelessly going up along the trail and breathing heavily but I could not feel that I was getting tired. I felt fine and my HR Monitor showed that I was on the mid-130s of my Heart Rate. I said there is no way that my heart rate is too low despite the intensity of my pace. The trail route became more challenging due to the presence of rocks which were eroded as part of the widening and improvement of the trail few years ago. A simple mistake of stepping on these rocks would make someone trip or fall on the ground due to imbalance of one’s footing. 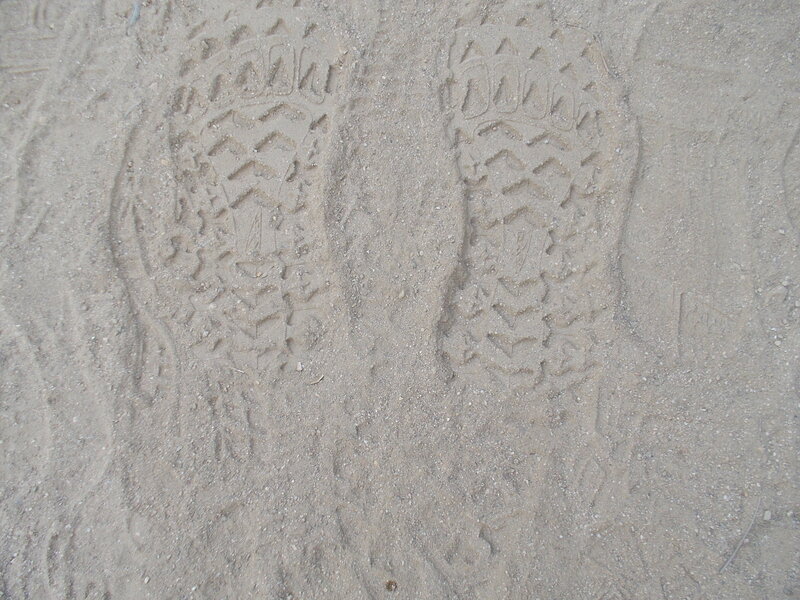 One has to be careful to land each foot due to the unevenness of the single-track trail. I knew that I would be able to reach the first Rest Station which is a concrete “waiting station” after making a sharp left turn/switchback and I was still maintaining my jog. After a few minutes, I was able to reach the Second Rest Station and I readied myself for the start of the steepest portion of the trail. Two years ago, there was a Bamboo Hand Rail standing and supported by two bamboo posts where one could hold as you plant your feet higher and higher towards the peak. All I could see was old wooden cross along the trail and it warns me that I was only 300 meters away from the peak of the Hill. Slowly, the steep part of the trail became lesser in incline and I know that I was about to reach the marker telling all the hikers that the Peak of the Hill is very near. Finally, one has to get his satisfaction of reaching the peak of the mountain when you see a pathway made of rocks. These pathway of rocks leads to the Concrete White Cross on the Peak of the Hill. As soon as I reached the White Cross, I had to touch/tap it and I was on my way back to the trail where I came from and back to the Fernandez Hill Complex. I glanced on my Garmin Watch and it registered a time of 31:32 minutes!!! I was excited to find out how fast I was even if I did not recall what was my recorded time on my first timed ascent to this hill 3 years ago. I knew that I was faster than my first attempt. So happy about my performance, I tried to stay focused on my run back to my starting area. I took time to avoid those rocks and not to be very aggressive on the downhill run. My ALTRA Lone Peak 1.5 was very responsive and I did not have any slip or slide on the damp surface of the trail and on the rocks. I did not hike or stopped along the way except when I had to slowly approach and cross the three streams along the route. I was very attentive to my footing and I could not afford to break my ankles or trip my foot or fall on the ground due to some mistakes. I still had water in my hand-held water bottle as I got nearer to the finish line. It was still cold in the early morning when I started my run but I would take some sip of water as soon I started sweating during my uphill climb to the peak of the hill. 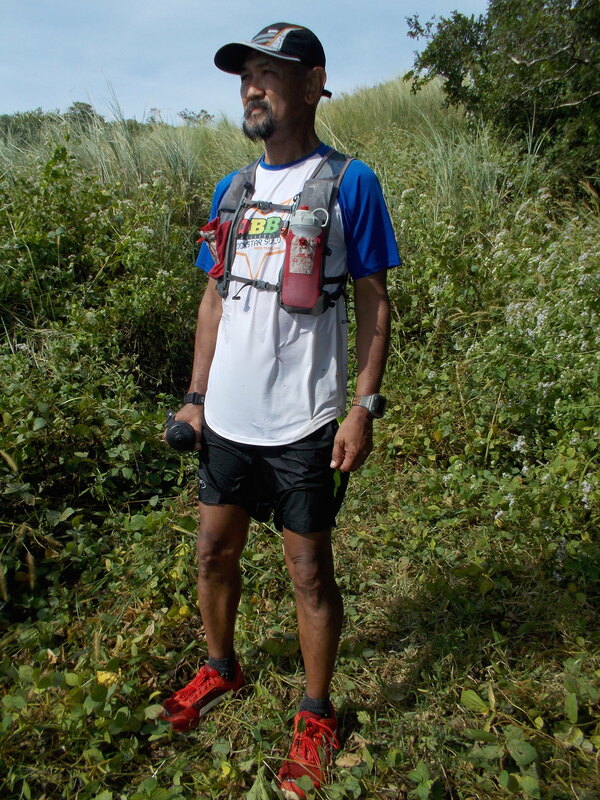 Once I reached the flatter sections of the trail, I would sip again some water from my bottle and this ritual was repeated every 5 minutes until I reached the starting line. After I crossed my imaginary finish line at the Fernandez Hill, I glanced at my Garmin Forerunner Watch and it registered a time of 1:11+ hours! Not bad! I think I was able to rest for about 2-3 minutes by refilling my hand-held water bottle and by walking to the location of the Water Hydration Point at the Aid Station located at the View Deck of Fernandez Hill and back to the starting line. It was time to go back again to the Peak for my 2nd Repeat. Prior to my start of my first run to the peak, a group of soldiers from the Special Forces Regiment were dropped by a 6 X 6 Military Truck by about 400 meters ahead of my starting area and they were ahead of me by almost 15 minutes. On my last 500 meters before reaching the Peak of the Hill, I was able to pass them one by one. They were carrying their backpacks, some carpentry tools and digging tools, too! Aside from the soldiers who are stationed at the Peak of the Hill, I have also those soldiers whom I have passed along the trail as my witnesses for my run towards the Peak. I just took my time and maintained my jogging for my second repeat of my climb to the peak of Taklang Damulag. The soldiers stationed at the peak of the hill were surprised to see me back to their location as I immediately proceeded back to the starting line after I tapped the White Concrete Cross. Once again, I was very slow and focused to my footing as I descended from the hill and I was bale to avoid those rocks scattered on some portions of the trail. My ritual once I arrived at the Fernandez Hill area was the same—walk to the View Deck; refill my water bottles; and walk again back to the starting line. I was already on my third repeat back to the peak of the hill as the sun was coming out from the clouds. 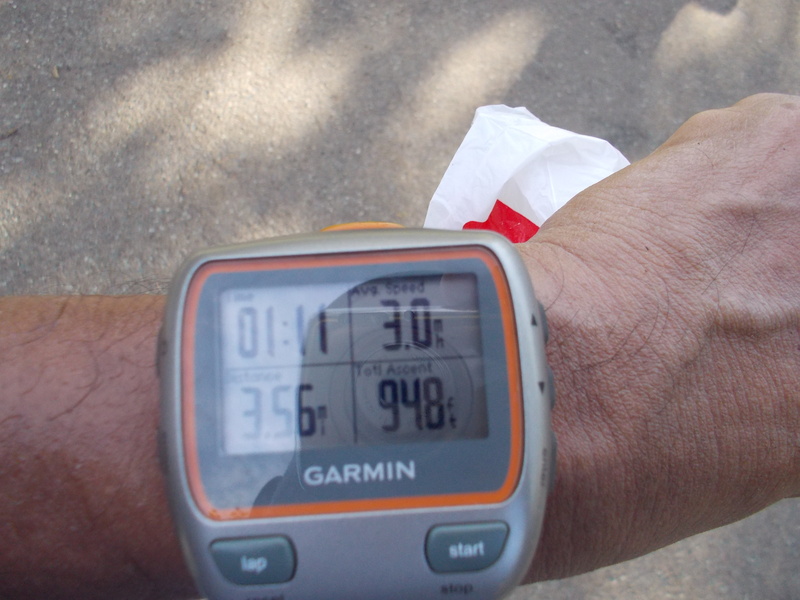 It was starting to get hot as I was running on my first kilometer of my third ascent to the hill. I had to drink more water from my hydration bottle as I progressed to the peak of the hill. Five hundred meters from the peak, I started to meet those soldiers who have finished their job/task as they descended back to Fernandez Hill. They greeted me and surprised that I was back again towards to the peak of the hill. I just thanked them for their greetings and smiled at them as I continued my jogging. For the third time, I made a tap to the concrete white cross and asked one of the soldiers for some water to douse my head and face as I could feel already the heat of the sun. It was already 11:00 AM. I took a sit on a chair while the soldier got me a half liter of water. I immediately doused the water on my head and on my buff and it gave me some comfort and relaxed feeling. After saying “Thank You” to the soldier, I was back on the trail back to the starting line. One kilometer away from the starting line, I started to meet the first two runners of the 50-mile race and then the third runner on my last 500 meters. I had to side-step and stand still on the side of the single-track trail as I wait for the runner to pass me. I would greet and cheer them as they continue their climb. I was thinking of doing my fourth repeat to the peak while I was on my last 200 meters to the starting line at the Fernandez Hill. I finally decided to take some time to rest and then eat some solid food at the Aid Station before I would decide to continue or not for my 4th and last climb for the day. After I ate my lunch, I looked back on my watch and found out that I was able to run a total of 10+ miles and my programmed schedule for the day was already attained and complied. So, I finally decided to end my run for the day and made already a plan to do another “hill repeats” on the following day. I know that this “crazy” effort that I’ve done is spreading from one soldier and Officer to another in Fort Magsaysay and by this time, it is already well-known for the entire Philippine Army. I consider this feat as a record for me (62 years old) and as a Retired Major General of the Armed Forces of the Philippines. And I will be coming back to improve this record in the coming years, whether it will be the fastest time for the climb to the peak and back to Fernandez Hill or for the number of times that I could do on the “hill repeats” in one day/setting. Who knows, this could be the birth of another challenging trail running event in Taklang Damulag—-“Taklang Damulag FKT Challenge” (6 Hours & 12 Hours Timed Event) where the one with the most number of “hill repeats” wins the event. Taklang Damulag will forever be a symbol and something to treasure in one’s life in the Philippine Army. 1. Started late in the afternoon and it became dark where I had to use my headlight on the 2nd half of the run. My run became slower when it was dark already. 2. It was slightly raining and I had to use my Eddie Bauer Waterproof Jacket with Hood during the duration of the run. 3. Brought two (2) bottles of 20 oz. each capacity; 4 pieces of GU Gels; 3 pieces of Power Bars; one piece of Honey Stinger Chews; Pocket Camera; iPhone; and Thermal Blanket. I purposely brought all these items in my pack to put more weight and have my body accustomed to the food/nutrition needs and required/mandatory items that I will carry with me during the race. 4. 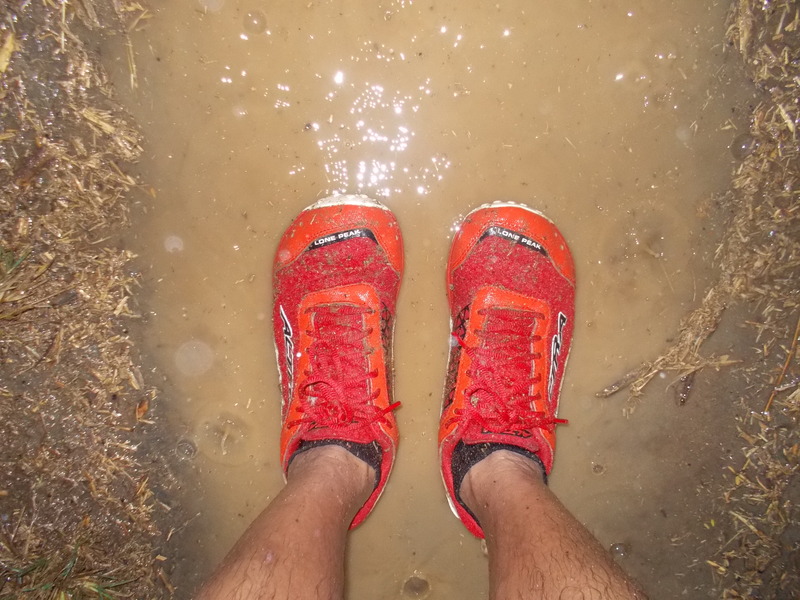 I used my INOV-8 X-Talon Trail Shoe and it was responsive on the wet condition of the trail and rocks along the route. 5. How I wished I could go higher in elevation in the mountain but due to the thick growth of grasses along the trail which need to be cleaned and cut, I decided to turn-around at 1,150 feet elevation. 6. The Eddie Bauer Jacket which I bought 5 years ago was very effective in preventing the rain from getting inside my body. However, my body sweat made the lining of the jacket to be damp and wet which made the Jacket to be heavier as I finished my run. 7. My legs and knees started to become painful as I descended on the downhill portions of the route as I went back to where I started. I have observed that my leg muscles became tighter as I went downhill but I persevered by taking shorter strides and lighter with my footing along the trail. 8. I had a “deep-tissue” massage after my dinner and the soreness and pain disappeared as I went to bed. Rest. I am scheduled to have a 6-mile run but I decided to have a rest after being late to my place of training after a trip to another venue of one of my races where I am the Race Organizer/Race Director. Instead, I did some body squats and lunges to find out if I still have pain and soreness to my legs. The “deep-tissue” massage the night before “fixed” my issues about my legs. I slept early in the night…eight hours of sleep! 1. The run was done in the morning and the weather was with clear sky and slightly cold weather in the mountain. 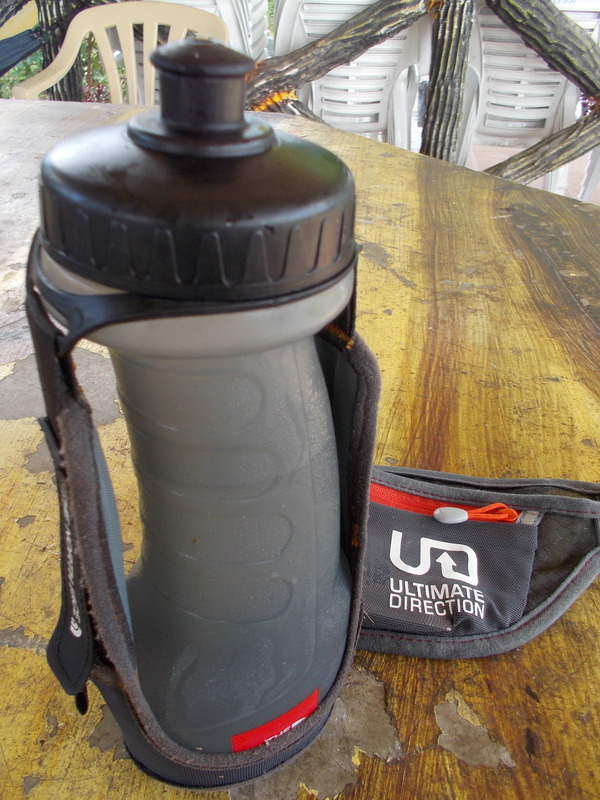 My water/hydration system was the same with that of the Tuesday Run, consuming 40 oz. of water during the run. I added two (2) pieces of VFuel Gels in my pack and I was able to ingest one piece of Gel on my second half of the run. 2. I felt lighter without the Jacket and I was comfortable with my pack with the same content that I had during the Tuesday Run. 3. 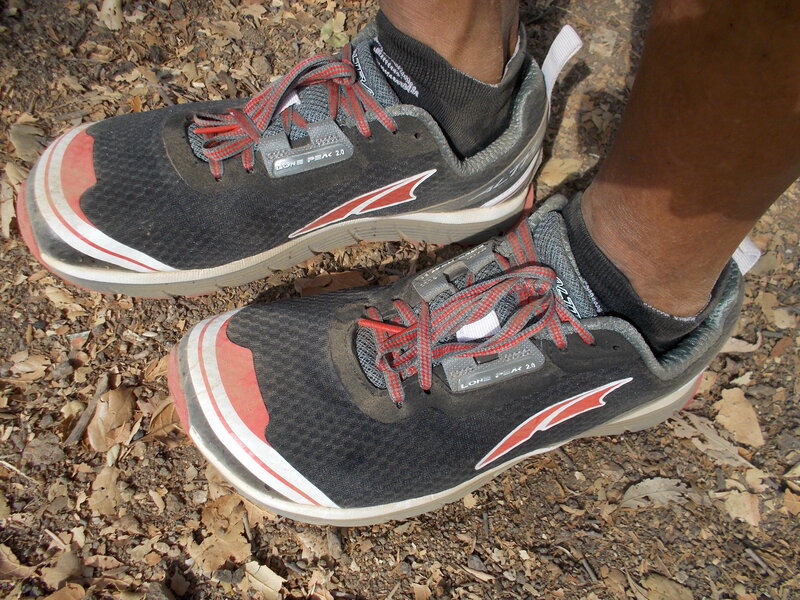 I used my ALTRA Lone Peak 1.5 Shoes and they are responsive to the trail and rocks. 4. The highest elevation of 1,575 feet was reached at 3.1 Mile but I decided to have my turn-around at this point due to the thick bushes and grasses along the unused trail towards the peak of the mountain. In my estimate there is a need to clean the trail for a distance of about 2 miles until I reach the peak of the mountain. If the highest elevation of this mountain will reach 2,100+ feet in less than 6-Mile distance, this could be my ideal training ground for my TransLantau 100 Race. 5. The massage that I got last Tuesday evening and Full Rest Day on Wednesday gave me a better performance for today. I did not feel any pain or soreness or tightness on my leg muscles and knees on my downhill runs back to Starting Area. It resulted to a faster Average Speed in my workout. Rest. I had a trip to Fort Magsaysay to attend a Coordinating Conference regarding my race thereat to be held on the weekend. 1. While supervising my race as the Race Director, I thought of running the course from Fernandez Hill View Deck to the Peak of Taklang Damulag (Hill) trying to find out how many “hill repeats” that I can do until I am tired. However, my training program called for a 10-mile run and any distance after that would be a bonus. 2. The weather was cooler in the early part of the morning but it became hotter on my third climb to the peak. I was carrying my TNF Hand-held Bottle which is just enough for my hydration need for one trip. 3. I had to rest for about 2-3 minutes just enough to make refill on my water bottle and eat something, most specially before I started my third climb. 4. I used my ALTRA Lone Peak 1.5 which was very responsive on the slippery trail and rocks along the route. However, the shoes became heavier as it became wet/damp from the sweat going to my socks and full body. 5. I did not have any problems or soreness on my legs during the duration of the run. If only not for the heat of the sun, I could have attempted a 4th climb to the peak. 6. 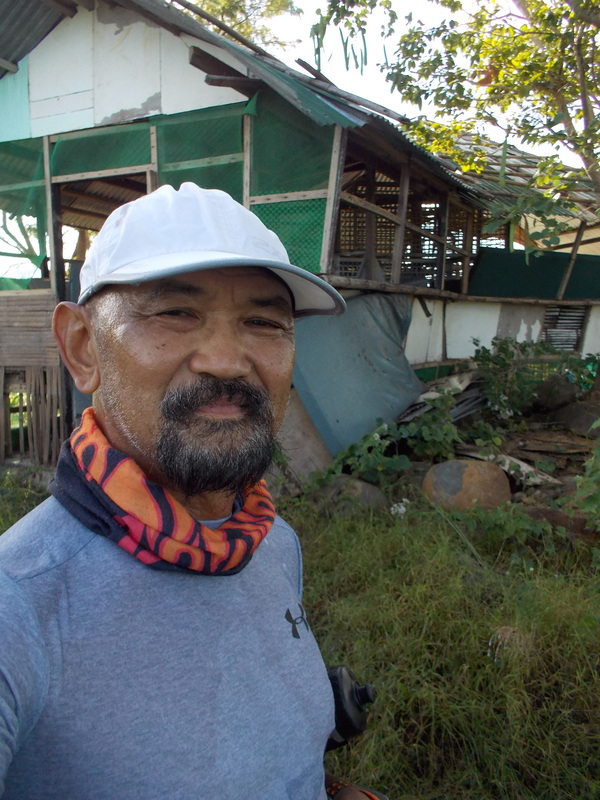 I will make a point to visit Fort Magsaysay at least once a month and try to break my personal record on how many times I could climb the peak of Taklang Damulag in one day or 12 hours! 7. I was averaging 1:11+ hours per “hill repeat” which is a big improvement on my performance in climbing the hill two years ago. 1. I felt I was not wasted from yesterday’s triple trip to Taklang Damulag. For today, I did two “hill repeats” which I expected to have a distance of 7 miles but my running effort was satisfactory. 2. I used my INOV-8 X-Talon Trail Shoes and they were very light and was able to have a very nice leg turn-over during the duration of the workout. I might be slower this time but I feel strong to finish another repeat after completing my scheduled distance for the day. 3. Just the same with yesterday’s run, I was using my TNF Hand-held bottle. I had my breakfast before I started the run and it gave me the energy throughout the workout.